Welcome to the Peachy Keen Halloween Blog Hop!! What a way to kick off a Monday!! If you arrived here from the super talented Viv's blog, then you are on the right track, but if not, then please be sure to go back to the Peachy Keen Stamps Blog and start hopping from there, so you don't miss out on one amazing creation. There are three new sets being released today at Peachy Keen Stamps, and I'm going to show you a fun little project I did with one of them. Today, I'm showcasing the adorable Halloween Minis (PK 631) stamp set. While I was shopping at my LSS the other day, I found these adorable little paper mache' hats, and I thought they would be really cute covered in paper and decorated with my stamps, so that's what I did. I put my completed hat on this cute little pumpkin, and it looks so great sitting on the table as our centerpiece inside a bittersweet vine wreath. This was so much fun, and just serves as a reminder to me that I can do so much more with my stamps than make just a card or scrapbook page. I would love to do another one of these and work it into a Fall wreath. That would be soooooo cute!!!! Here's a little closer look at some of the cute little images that come with the Halloween Minis set. In total, there are seven fantastic images and two sentiments with this set, which make it so versatile and a great "go to" set for all your Halloween gift giving and crafting. I used K&Co. paper from the Tim Coffey collection for my hat, and embellished with assorted ribbon and fall leaves. Besides the release of these stamps today, would you like some more fantastic news? I'm going to be giving away one of these Halloween Minis stamp sets (shown below) to one lucky commenter on my blog,courtesy of Kathy J., and Peachy Keen Stamps. You will have until Friday, September 3rd, to leave your comment for a chance to win. The winner will be chosen at random right before my Friday morning post. Remember, all you have to do is leave a comment, and if you're not one of my followers, and you like what you see here, please consider adding your name to the list. Now before I send you hopping to Janice's wonderful blog, I want to remind you that each designer on this hop will be showcasing a different stamp set, and be offering that set to a lucky commenter on their blog, too, so there are 10 chances to win along this blog hop. They have all worked really hard to bring you some fabulous creations featuring these amazing stamps. Below, is a complete list of stops for this Halloween blog hop in correct order, in case you should get lost along the way. Thanks so very much for stopping by today. Good luck, enjoy the hop, and hold on, because you're in for a Halloween treat that can't be beat!!!!! Enjoy!! your halloween decor is so adorable.. this came out so good. That is awesome! Thank you for sharing and for the opportunity to win a stamp set. This centerpiece is just AWESOME!!!!! I LOVE IT!!!!!!!! !Just became a follower! OMG that is absolutely gorgeous. WOW, what imagination and creativity. cute stamp set I love how you colored them, AWESOME!! These stamps added to the Halloween decoration. that is so cute, love what you did with the stamps! This is such a cute idea! I never would have thought to use the stamps this way. oh that hat is absolutely fantastic! how awesome! thanks for the chance to win this stamp set!!! WOW! That is just, WoW! I love it, What a great idea, im amazed at the wonderful creations you come up with!! Thanks for the chance to win some of these amazing sets! such a great project! Thanks for sharing! I love this stamp set too!! Love how you used the stamps. One does tend to forget they are not just for cards or scrapbooking. Great job. This is way to cute Lorie!! You Go Lorie, this is Awwwwwsome! I love your "out-of-the-box" design on this one. Wow- you are a super creative woman I love your pumpkin's hat! Thanks for the chance to win! Holy Canolli!!! You have floored me with this fabulous creation! Now I want to make one. Thanks for being such an inspiration to me and the world! Just awesome! You are so very creative! I love the way you decorated the hat using the characters from the stamps! Great idea! Wow that hat is AMAZING. I love what you've done with the stamps! THanks for sharing! Wow! Just stunning! Thanks for the opportunity to win this set of peachy keens - love all their stamps! Lorie.... I just fainted!!! Your project is so delectable it should be in a SHOP window!!! YOU, are a worker of magic my friend! In this case...black magic! *wink*! this project is georgeous !!! OMG you did such a wonderful job! First - Viv says hi... it says so right on her 'hop note'. I love your work. What a great idea!!! I swear I think I am creative until I start hopping... and then a whole new world is opened to me! Lol. I am in AWE! I think that is so neat how you are thinking outside the box. Awesome job! These are fantastic, they have really given me inspiration ready for my Halloween Party!! You are very creative! I absolutey think it is beautiful!! I love peachy keen stamps, so happy I found these blogs!! Love this centerpiece. I would never have thought of this. What a great project! Those stamps are the cutest!!! Lorie - Viv says hi! That is a great idea for a use of those cutie stamps!! Adding that to my list of inspiration! OMG....The hat is Amazing!!!!! Gonna have to make an adult size one now....lol, it's just too cute not to wear around and share with everyone!!!! awesome job!!! OMG! Your project is soooo pretty!! Ok Lorie...I will be sending you my hospital bill because I just fell off my chair when I saw this out of the world creation!!! HOLY COW. You truly never do fail to amaze me!!!! Oh and I will be sending you my dentist bill to because my mouth fell open onto my desk and I chipped a couple of teeth! This is too beautiful! I love your work. Thanks for the chance to win these wonderful stamps. The little spider just cracks me up. I like all of the stamps but he is the best!! That is so cute! Great job! I love your blog, I just joined it. That hat is the cutest! Great job! I love it!! Very creative. Your hat is so cute! These stamps are just too cute to pass up! How cute. What a great centerpiece! I want to make something like that. I'd love to win a set of these great stamps. Your centerpiece is beautiful! It looks like it took a lot of work, but is worth it. Thanks for sharing! These Halloween mini's are my new favorite stamps, although I love them all! I love the witches hat project you did...I may have to scraplift...soooo cute!! Such a cute idea!! You are always thinking outside the box, Lorie! I love all the stamps--but I think this is my favorite set! Well, you are one clever girl. Your center piece idea is soooo cute. TFS. What a unique idea! Way to think outside the "scrap box". Well goodness gracious, now this is the absolutely gem of Halloween creations! STUNNING is simply not big enough a word! There is so much detail, whimsy, creativity wrapped up into this beauty - you have outdone yourself, Lorie! Gorgeous, Gorgeous! Hugs! OMG, you are so talented, love your design. Love your halloween decorations!! and love the blog!! Your Halloween decore is amazing... I absolutely love love it..Thank you so much for the chance to win these fabulous stamps. I love your Halloween decoration that you made. Thank you for sharing these wonderful ideas with us. Oooo these look absolutely adorable! I'd love to be a lucky winner!!! Thank you for sharing your talent and giving us the chance to win goodies! Really appreciate both..
Wow! Your hat centerpiece is impressive! Very professional looking. I absolutely love it. Thank you for the chance to win a stamp set. Your center piece is cute, I am thinking on trying it because I have a pumpkin almost like that. Thank you for this chance to win. WOW! You are amazing, Thanks for sharing!! Your hat centerpiece is wonderful. You have given me a great idea so will be going shopping. Thanks for the lovely project. These stamps are adorable. Love your project. love the design, that is definatly outside the box. wow, great set. Wow you made such a great project! It's so cute and I love this stamp set! The ghost and little bat are too cute. Thanks for sharing! Love the hat! How creative! The stamp set is adorable! Great ideal using the new stamps. Thanks for sharing, and the change to be a winner. Thanks for the chance...let me hop to the next one.. This is too awesome. I Love it! I love to see projects other than cards made with Peachy Keen Stamps. Thanks so much. that center piece is really super! Lorie, Talk about creative~ WOW! Love it! I love the Halloween Minis, if I had to choose from them. I am already follow you, you do wonderful tutorials with the copics! Cute projects. Thanks for the chance to win!! wow.. i love your project.. its so.. "outside the box" and its adorable! thanks so much for sharing and the chance to win! Adorable centerpiece. Love the stamps. SUCH a cute project! Thank you so much for the chance to win! WOW WOW and WOW that is just a masterpiece!!! Love it!!! I would so much like to win. Thanks. Oh my gosh...My jaw hit the floor when I saw your centerpiece...it is fantabulous!!! You are so right about using stamps adn Cricut cuts for more then just cards and pages...I need to start being more creative with my projects!!! What a wonderful centerpiece. You did a fabulous job. Love these stamps they are so cute. thanks so much. OMG what a great project - how creative are you!!! Are you kidding me - that hat is fantastic!!! How creative I just love it. How cute, what great work! WOW!!! do i have to say more...your centerpiece is amazing...love those stamps! Great work...so cute. Viv says Hi! I would love a chance to win a set of stamps. They are too cute and just in time for Halloween. Thanks for giving us a chance to win the stamp set. Love your ideas. This decor is so inspiring!! ALthough I'm not crazy about the actual holiday of Halloween(i dont like being scared LOL) I love decorating with cute decorations and making cute cards!! Its just beautiful! Thank you for the chance to win this adorable stamp set! Would so love a set of these. They are so adorable. Love your display. Great.. AMAZING!! This centerpiece is adorable!! You have some mad coloring skills. I love love love your project! It is so freaking cute! What a great centerpiece for anyone's Halloween Table! Oh, This is so much fun! Thanks for sharing all your hard work! I don't have any of the Peachy Keen Stamps! I would love to have my first set! OK now i have to get PCS, no more puttin it off. Super fun! Thanks for the great ideas! WOW!!! This is seriously so amazing! I LOVE it! And thanks for a chance to win the stamps :). me at glorajean dot com. Awesome use for these cute stamps!! I love them!! Thanks for the chance to win. I never would have thought to do something other than cards with the stamps! very ingenious! I would love to win! I LOVE this project! You really thought outside the box... I would never have considered altering a hat - how cute! What a sweet centerpiece. 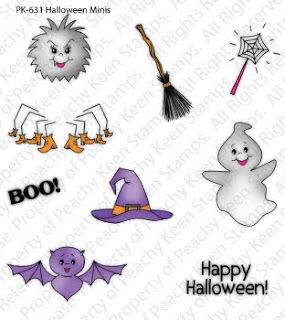 I am a huge peachy keen stamp lover so I love these cuties for Halloween!! Very creative! I hope I win the set! Wow Lorie this is a great project. I love all the details and that ribbon wow. OMG, that hat is totally SPOOKALICIOUS!!!!! I just love it.. Thanks for the chance to win!!! I love your project! Makes a nice Halloween decor! Thanks for the opp! that is a great centerpiece! I love how you incorporated the stamps, they are so durn cute! WOW ! This is an incredible project !!! Super cute ! Martha C.
What an adorable project! I can't wait to start working on Halloween stuff and would love to win this!! Wow, I never thought of using stamps in a center piece. Great job. Love it! off to more blogging! Your pumpkin project is phenomenal! I would love to win this adorable set! Lorie, I want to do that!!!! You are sooo talented! I just may scraplift your beautiful witches hat idea!!! I wish we lived closer so I could come over and spend a LOT of time with you! Your project is absolutely amazing! This will look so beautiful on your table! Wow! the stamped images look so natural on the hat what a lovely job you did! Thanks for sharing and for such a wonderful idea! OMG that is absolutely gorgeous. I loved that you did a Home Decor project. I really need inspiration in that dept. TFS! Viv says "Hi"! What a cute project. I love these stamps. Viv said to tell you Hi from her. The hat is the cutest things I've seen in awhile. Thanks for the chance to win. OK, how cute is that?? So cute that it would look perfect on my kitchen table!! :-) Great job! Your hat is so cute. Thanks for oportunity to win this great little set. What a wonderful decoration and of course the coloring is magnificent! WOW...Your project is beautiful and I just love these new stamps. I must say that your coloring is absolutely perfect! Thanks for the chance to win! What a fantastic idea. I would never have thought of it. You have really opened my eyes.. I just love that decoration. Really great work. I"m so impressed. What a fantastic idea!!!! I LOVE Halloween and this these stamps sets are sooooo cute! I have the perfect papers to do this with... now to go get the hat and this stamp set!!! Thanks for the inspiration! That is the cutest and most creative centerpiece! I Love it! TFS!!! That is so cute! I just love these stamps. Ok I just have to say what an awesome job, I love your creativity great job. That is one fantastic project... YOu really have my wheels spinning and I am so ready to get creative. Now I am just crossing my fingers to win! Wow that is some hat! I love it! So Adorable. I love all of cards and stamps I have seen !What an awesome team of crafters! that is soo clever - love the twist on using the stamps! This is a great idea...love the chance to win...gotta hop..
Beautiful centerpiece! As a fan of peachy keen stamps I would love to win this set. TFS! What a beautiful way to welcome in fall with a darling centerpiece. Thank you a chance to win. Such a smart creation!Id love to win a set! You always have such sweet creations, I love following. Thanks for a chance!!! OH MY GOSH!!! This is amazing! so cute! I just love it! so creative! I love these little guys and would love to win, thanks for a chance to. OMG! You did such a great job!! Wow you're amazing at what you do! I love your project! So cute! What a cute halloween decoration!! I would love to win this stamp set!! Very cute project! I would have to say that this set is my favorite but they are all so cute!! OMG... Your project is amazing!! Love it!! Thanks forhoppin today, had a good time!! What a great centerpiece! The stamps are so cute! Love the mini stamp set! Thanks for a chance to win a set! I love the spider web wand...very cute! You are so creative. I wouldn't have tough about a centerpiece. Great job!!! This is so cute!! What a great idea to create a centerpiece. Thanks for sharing and the chance to win. I love the images on the set it is really cute. How cute! The spider has boots on all of it's feet in that stamp set! Wonderful hat and it looks so stunning!! This pumpkin is beautiful!!! Love it! Great Idea! I am loving these new stamp sets!! I am so ready for Fall!! Oh so cute! Love the spider legs with the shoes!!! awesome! Super cute!! I'm gonna have to use this for inspiation for my pumpkins this year!! Thanks! What a great project, love it!! Awesome project and cute stamps. Thanks for the opportunity to win! !